Facebook founder Mark Zuckerberg is known for leading a more humble lifestyle than you'd think a man worth a gazillion dollars would. That includes his car, which is a nice little VW GTI. Good for him. 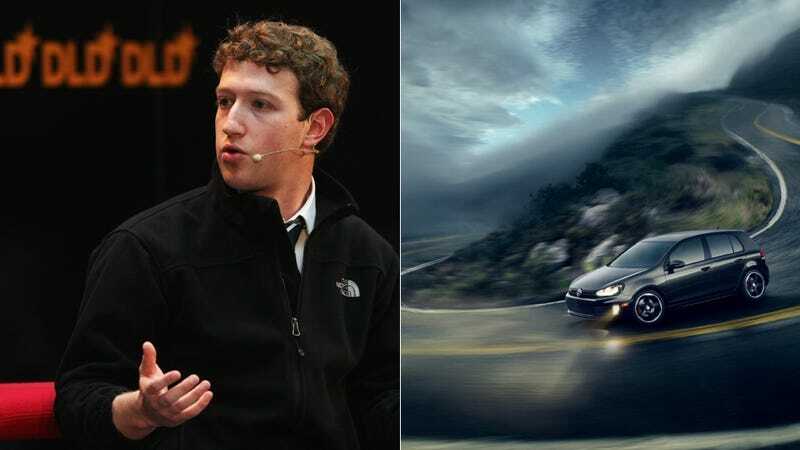 In a story in The Wall Street Journal, it's said that Zuckerberg drives a black GTI with a manual transmission. So not only does he own a hot hatchback, he drives stick. I think that means we can assume that Facebook officially endorses the campaign to save the manuals. This is a good thing. It's also an upgrade from his last car, which was an Acura TSX. Though, perhaps he kept the TSX and now drives both, in which case that would be an overt display of opulence and wealth and not modest at all. Imagine, a man with two $30,000 cars. He must live in a money dreamland.